HURRICANE — The Hurricane Lady Tigers won their fifth straight basketball game Thursday night, defeating visiting Pine View, 47-41. Hurricane started off the game on a strong note, opening a 15-4 lead late in the first quarter, with four different players scoring at least one field goal each. Pine View sophomore center Leiani Tonga converted a three-point play with 13 seconds left in the period to narrow the deficit to 14-7. Hurricane managed to stay around 10 points ahead throughout most of the second quarter, ultimately taking a 27-17 halftime lead. About a minute and a half into the third period, Hurricane’s Jayden Langford scored on an inside drive and got fouled. She converted the free throw to complete a three-point play that gave the Lady Tigers a 30-17 lead. 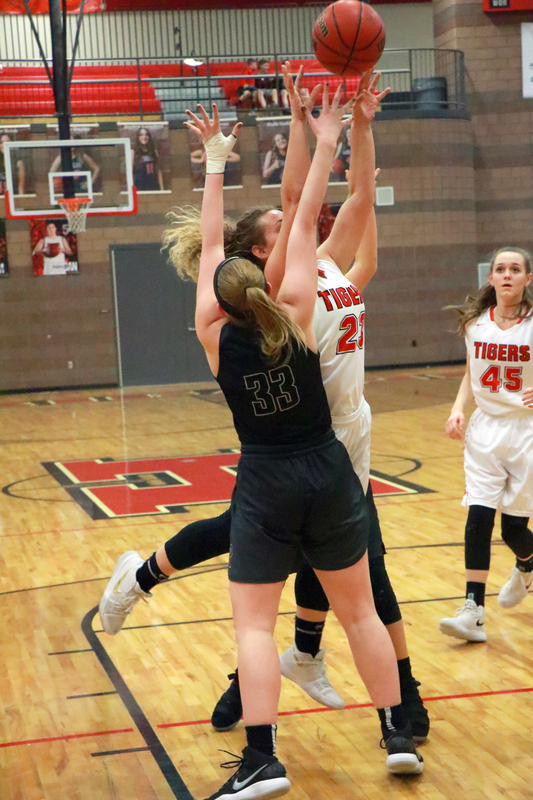 At that point, however, the Lady Tigers hit a cold spell as Pine View went on a 13-0 run, capped off by a 3-pointer by senior guard Claire Newby, who scored nine of the Panthers’ points during the rally. Newby’s trey evened the score at 30-30 with 2:00 left in the third. About a minute later, Hurricane guard Kylee Stevens buried a 3-pointer to put the Lady Tigers back ahead, 33-30, after which fellow guard Madi Hirschi sank another 3 in the closing seconds of the third period to give Hurricane a 36-30 cushion heading into the fourth quarter. Incredibly, Pine View was able to hold the Lady Tigers to a single field goal in the fourth quarter. However, Hurricane, which made 8 of 15 free throws during the final period, never lost its lead. With around two minutes remaining, Pine View guard Saraven Allen scored on an inside drive to cut Hurricane’s lead to five points, 41-36. Both teams missed their next couple shots, but Hirschi managed to swish a 3-pointer with 1:19 left to put Hurricane back up by eight. Just as Hirschi’s shot went through the net, Allen was whistled for a foul away from the ball, and Hurricane’s Kelbie Dayley sank both of the ensuing free throws to put Hurricane’s lead back at double digits, 46-36. The play also marked the fifth personal foul for Allen, sending the star guard to the bench for the remainder of the game. “That was a crucial play for us,” said coach Homer. Pine View then managed to stage a small rally and get back within five points, 46-41, with just over 45 seconds remaining. However, the Panthers missed their last couple shots. In fact, the only point scored by either team in the final 45 seconds was Hirschi’s last free throw with 13 seconds left. Langford led the Lady Tigers in scoring with 13 points, seven of which came on free throws. Stevens added 12 points and Hirschi made nine for Hurricane. The Lady Tigers made just 15 of 25 free throw attempts (60 percent) during the game, while Pine View converted 11 of 16 (69 percent). Pine View was led by Newby’s 16 points, with Allen adding eight points. 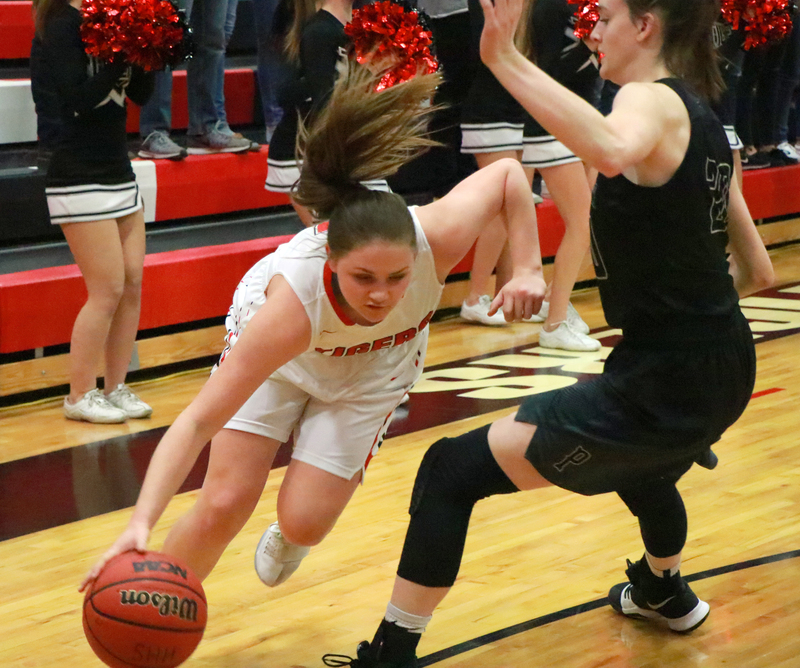 The Lady Tigers improved to 5-3 in region play, putting them a half-game behind second-place Pine View (6-3) in the Region 9 standings with two weeks left in the regular season. Cedar, which won at Snow Canyon Thursday, is now solely in first place in region with a 7-2 record. Hurricane will host Dixie for its next contest Feb. 6, while Pine View will host Desert Hills that same night. In other Region 9 action Thursday night, Canyon View snapped a seven-game region losing streak by defeating Dixie 49-46 on the Lady Flyers’ home floor. The game was close the whole way, with several lead changes throughout. The teams were tied at 14-14 after one quarter, but Canyon View held a two-point advantage at the half, 25-23. Dixie then outscored the Lady Falcons 12-9 during the third period to take a one-point lead into the fourth quarter, which proved to be a back-and-forth battle. “Everyone contributed and played like we can,” she said. Jordan Nielson led Canyon View’s balanced attack with 15 points, while Bryn Banks added 12 and Cristal Elias scored nine. Dixie head coach Ryan Forsey praised the play of junior center Sina Tapasa, who accounted for more than half of Dixie’s offensive output, pouring in 25 points on 12 of 17 shooting from the field. “I can’t say enough about the effort Sina Tapasa gave tonight,” Forsey said. “And I’m just as pleased with our guards, who got her the ball where she needed it. Canyon View improved to 2-7 in region play with the win, while Dixie dropped to 2-6 in region play. Dixie next plays at Hurricane on Feb. 6, while Canyon View hosts Snow Canyon that evening.